Word counts in HTML documents over SMB. On the right is a close-up of a Nixie tube which can be used as a web counter via an RS232c serial cable and sit on top of your server, incrementing each time someone hits your home page (or anything else, depending upon how you have it configured). The tubes themselves are attractive, run cold and, being a light emitter, they look good in the dark, adding to the sea of lights that you get when you switch the lights off for that all-night programming session. However, it is a bit selfish to have all of the fun for yourself. You should put them on your home page as well so that when someone hits your page, they can see on their copy of the page that you have taken the time and care to launch yourself into the abyss of geekiness by having one of these counters. Here is the counter as it appears on a web page, in this case, displaying the home page hits and the total page hits for a small, home server. In keeping with policies on graceful degradation and allowing the visually impaired to know what is going on, this is what it looks like with images turned off and, if you hover your mouse over one of the images when it is on, the same digits appear. In a Nixie tube, the digits are at different depths within the tube - a millimetre or so separates each one - and in this case, they are in the order, from back to front: 1; 6; 2; 7; 5; 0; 4; 9; 8; 3. This means that the tubes on the left are going to be photographed from the right and the ones on the right are going to be photographed from the left (you can see this effect in the image on the right from 2, 3, 4 - look at the right hand digit for the best effect). So, set up your camera on the tripod and get it to photograph all of the tubes displaying each digit, one at a time. Also, being a compact camera, it 'corrects' the exposure so, preserve the white balance by selecting 'daylight, sunny' or whatever. The exposure is all over the place but this can be corrected later. You can see from the images on the right that the exposure changes between these shots. Next, load them all into one image - you can do this on The GIMP by dragging the first image onto the main window and then highlight all of the remaining images in your file explorer and drop them all at the same time onto the GIMP image you have opened. Next, hide all but the bottom layer. Then, use two guides to note the x-y position of some feature that will not move between shots. This could be part of the background (all right if the focussing is consistent which it should be) or part of the hardware (a bit of grid that is in all of the shots or a part of a cut-out). Don't use a reflection as these move. Then, with cross-hairs in place, unhide the next layer up and move that layer so that the detail in the cross-hairs matches. These shouldn't be far out if at all because we have taken action to preclude this when we took the original shots. Repeat for each layer. Next, save the image as a GIMP xcf.gz image because now, we are going to do destructive things to it. Zoom-out the image so that it is about the right size and make a note of the zoom. Bring it back up to 100% and then you need to crop it. Assuming that you are using an 8-digit counter, crop the image so that the width is an integer multiple of 8 x the width of the final image. Next, colour correct all 10 layers. This is easier without the unwanted background that we have just removed. Now, we can reduce the size to our final size, all in one go. Once you've done this, you need to produce each nixie tube's digits so use the trim tool to crop the image down to the right size. Next, duplicate the image so that you have a new image with all 10, density-corrected, position-corrected images of the fist digit in it. Then, go back to your cropped original, press [Ctrl][Z] to undo the cropping process. Repeat the cropping process for your second digit this time. Then your third. Continue with this process until you have all eight digit-sets. A good idea is to arrange them in order on your desktop to avoid confusion. Now, take the first of the digits (the one on the left) and from the layers dialogue box, drag the layer with a '0' in it, onto the GIMP main window. A new window will open up containing just that one image. Now, save it with a meaningful name. One suggestion is that your files should have something in common that means something to you and then something that means something to the program you are going to write that uses these - the least programming the better. This image is of nixie tube '0' digit '0'. If we call the first one '0', the second tube '1' and so on, it works out better when we write the program because the index of the first character in a string is '0'. Repeat this for all 10 digits on the first tube and then the same again for all of the other tubes. It is worth it - they are all different. You should now end up with a directory like the one on the right. In this case, the images are all 22x28 pixels. Now that we have a counter value and a directory that has our digit images in it, we can write the program to put the relevant code on your web pages. width=22 height=28 border=0 alt=\"$cs\" title=\"$cs\">"
You can see that naming the images starting with zero for the position has worked out nicely because we just need two variables, one for the position ($x which is used to split the string any way) and one for that position's value which comes from the line $cs = substr($cc, $x, 1); . and this is what it looks like (the bottom one - to get another, just use a <br> tag and repeat the process (in this case, the home page counter followed by the total pages counter). Now, everyone can see your counter on your web pages (or, if you just copied the images, my counter on your web pages). Sometimes, you need to create the effect of translucency using a gradient. The procedure is fairly easy - you select the area you want to fill, the type of fill (radial, linear or whatever) and then fill it by dragging a line and letting the program do the rest. However, getting the right gradient can be a problem. You can play around with the values in the gradient editor but these efforts rarely produce acceptable fruit. An answer is to cheat by using a real subject from which you get the values for your translucent gradient. 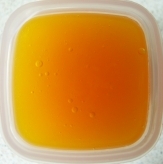 You can use anything but here, I've made some mango jam (just put some mango pulp in a saucepan with an equal quantity (by volume) of sugar and slowly bring it to the boil then let it cool down) and let it set in a small plastic container I bought from the local supermarket. It is photographed from above with the light coming in from the left side. a large version of the gradient on the right already prepared for you. Click on the dropper tool so that you can pick colours from your image and turn them into the foreground colour (the pick mode should be 'Set foreground colour' if you have options on that - the default if you haven't is that it will). Click on the gradient in the GIMP toolbox to open up the Gradients dialogue box. Next, click on the 'new gradient' button to open up the gradient editor. Type in the name for your new gradient and then stretch the dialogue box so that it is the same length as your gradient image and then position it so that it is below the gradient so that it is easy to work with. Now, we can start putting colours into the gradient. Use the dropper tool to pick the left-most colour from your real-life gradient. Right-click on the gradient bar at the bottom of the gradient and select 'Load Left colour from', 'FG Colour'. This will load the colour on the left and your gradient will change. Repeat this with the colour on the right of your image, this time selecting 'Load Right colour from', 'FG Colour'. Now, whilst the endpoints of your gradient are correct, the middle is probably not. So, use the dropper tool to pick the central colour from your real-life gradient - use the position of the centre marker from the gradient editor in the window below it as a guide. Right-click on the gradient bar at the bottom of the gradient and select 'Split segment at Midpoint'. This divides the current segment neatly into two, at the position where you have your current foreground colour. and right-click on the gradient bar at the bottom of the gradient, and select 'Load Right Colour from', 'FG Colour'. although this time, you will be able to see a step change in your gradient. Now, click on the next segment in the gradient to select it and then right-click on the segment bar and select 'Load right colour from', either 'FG Colour' or 'Left Neighbour's Right Endpoint' - they are both the same colour. Now, the gradient is smooth at the join. If you didn't have instant updates on, you need to click on the gradient dialogue's save button. Now, you have your new gradient ready to use. Using a gradient fill with these options, you can choose from a number of different shapes for fills but each of the 'shaped' shapes will fill from the edge towards the centre, using the right-hand colour as the starting colour at the edge of the mask, working in, towards the centre, using the same scale as the largest distance it finds. So, drag the mouse over the mask (this is so that the gradient fill recognises that you want to fill a gradient) and it then looks for the largest edge-to-centre distance. It then fills according to the distance from the edge so if your largest distance was 20 pixels, but it only has to fill to 10 for the current shape, it will only use half of the gradient on that part. Create a new image - I've used 800x600. In the 'Layers' dialogue box, right-click on the 'Background' layer and select 'Add Alpha Channel' - this will allow you to put other layers below it, out of the way of where you are working. Then click on the new layer button, creating a new layer with a fill-type of 'Transparency' - click on 'OK'. Write your text - in the example (in the toolbox, click on the 'Text' - 'Add text to the image' button in the GIMP toolbox), I've used Gill Sans Ultra Bold at 171 point aligned centrally. It doesn't matter about the colour. In the layers dialogue, drag the text layer below the background layer. Next, right-click and select 'Alpha to Selection' which will allow us to play around with the outline. Click on the new layer in the Layers dialogue and then right-click on the image itself, and choose 'Select', 'Shrink'; and then, say, '6'. Click on 'OK' and our mask has shrunk. Next, right-click and choose 'Select', 'Grow'; and then the same value - '6'. Click on 'OK' and our mask has now grown back to the same size as before but now, it has rounded corners. Drag the foreground colour into it to fill the mask in our transparent layer and you have a reference copy of our new text shape. Now, create a new transparent layer and then drag our filled text layer below the background to put it out of the way. Select the transparent layer to make it the current layer and then check its 'Keep transparency' checkbox. Next, drag black from the colour toolbox into the layer to fill it. Still in the Layers dialogue, right-click and choose 'Alpha to Selection'. On the image, right-click and choose 'Select', 'Feather...' and then use 40. Next, drag white from the colour toolbox into the layer to fill it. Then, press [Ctrl][Shift][A] to remove the mask. Then, click on the Adjust colour curves tool in the toolbox and click on the image. Adjust the curve so that the lowest density coincides with the bottom of the curve and pull the highest density down so that we get the central part of the mango jam curve (this will be lit from both sides, not just one so we don't need the shadow side of the gradient). Adjust the gamma of the curve - one way is to perform the following step having saved this gradient, then undo the following step, reapplying this step but by opening the curve you saved, adjusting the gamma then saving it again, repeating until you have exactly what you want. Once it is right, click 'OK'. Now, we can make it look as though the surface is concave at the edges (like the meniscus of a liquid that has cooled) by creating a bump map and applying that. So, first of all, create a new layer filled with white (this is the lazy way because black is not offered). Next, feather the mask by right-clicking and choosing 'Select', 'Feather' and using '12' as the value - click 'OK'. Then, cut out the image by pressing [Ctrl][X]. Now, create a new layer and drag black into it. Place it below the mask. This gives us fuzzy edges on the high and low density sides (the left hand curve) which is not what we want - we want a meniscus that has a sharp edge to it like the curve on the right. However, the part we don't want falls on the outside of our mask so we don't need to worry about it at the moment. We now have two layers - one with a white background and one that is black beneath it. In the Layers dialogue, right-click on the white image layer and select 'Merge Down'. Next, click on the foreground/background tool, (foreground) and then again to bring up the foreground editor and edit the current colour to a mid grey. In the Layers dialogue, create a new layer with the foreground colour - this grey layer becomes the current layer. Next, on the image, right-click and select 'Filters', 'Map', 'Bump Map'. Select the bump map layer we have created in the previous step and the Map type should be 'Sinusoidal'. Adjust the 'Depth' until it is what you want. When you have finished, click on 'OK'. Next, use the colour picker to get a sample of the new background colour of the bump-mapped image (the one at the top in the screen-shot on the right). Then, in the Layers dialogue, duplicate that image layer but hide it. Then, right-click on the text layer and select 'Alpha to Selection'. Then, in the image, press [Ctrl][I] to invert the mask (alternatively, right-click and choose 'Select', 'Invert'). Now, press [Ctrl][X] to cut away the outside. If you hide the mask so that all you can see is the current layer and the background (the text is the same size so we can't see that) then it should look like it's made from grey plastic lit from the lower-left. Next, right-click on the image and select 'Filters', 'Colours', 'Colour to Alpha...'. Now, drag the colour from the foreground colour (that we picked earlier) and drop it on the colour bar in the dialogue box. This is taken from the image and as you can see, we have eliminated all but the highlights and shadows that the bumpmap process has created. Click on 'OK' and you can see it on the image. Next, select the other bitmapped image and then the threshold tool from the toolbox. Click on the image and with preview selected, choose a value that is close to the upper limit so that you only get the very highlights of the image. Now, in the Layers dialogue box, right-click on the text/transparent background layer and select 'Alpha to Selection'. Select our 'thresholded' layer. Go back to the image and press [Ctrl][I] to invert the mask and then [Ctrl][X] to cut out the background. Back in the Layers dialogue, select the 'Mode:' as 'Lighten only' (it is only black and white so black will not lighten anything). Now, it looks like it is made from some sort of jelly or sugar preparation, illuminated from the lower-right. It certainly looks good enough to eat (but would probably be bad for you). You can change the shininess of the surface by changing the transparency of the layer we have just created - around 60% gives a good value for what we want. Now to make it look as though it is in something (and therefore lit from the top-left), just add a container, drop-shadow and other visual clues to reinforce this. Believe it or not, the only thing that has changed between the two images is the background, the letters are completely unchanged. The important thing to remember here is that by having all of your highlight, reflections and so on as different layers, you can change them until you are satisfied with it - you are not stuck with a load of options on a dialogue box that you have to tweak and re-run all of the time: If you want to make the surface a bit more reflective, make the reflections more opaque; If you want to make the lighting harder, increase the opacity of the drop-shadow; and, so on. SMB is a fairly good way of mounting directories on other computers into your system so that you can access files and other resources as though they were local. However, being network-based, there are limits to its speed (even with Linux which is around four times faster than the same process in Windows) so if you need to transfer a lot of files, you will experience an impact on your productivity. In this example, we want to perform a word count on last month's SuperDVD HTML file. ... it takes five seconds for the word processor to load and then a further 36 seconds for the document to load. We can't do anything about the time it takes for the word processor to load but we can about the rest of the process. For the sake of performing a word count, the images don't matter so if we drag and drop the file from the browser window onto the desktop, we lose the relative links in the HTML file (they aren't modified by the copy process so now they all point to files that don't exist in its current context). This means that when the word processor looks for them, it won't find any of them and therefore won't waste any time trying to load them from a remote machine (it doesn't know where the HTML file came from). In our example, copying the file took two seconds (if that). Next, we open the file as before and get it to load in the word processor. But now, there are no images for it to pull over the network. Now, the loading process takes only two seconds. 2 + 2 = 4 seconds plus the five seconds as compared to 36 plus the five seconds we had before. and here we are with 9,552 words. Whilst we have only saved just over 30 seconds for this one file, if we want to do this procedure for ten or so files, we are already talking about substantial savings.